Peggy Foy's Studio Log | Peggy Foy Jewelry around town! This month I have work in two exhibits around the Seattle area. There’s the Seattle Metals Guild Biennial Exhibition at the Washington State Convention Center, on display through June 21st. I have a new necklace, “Paging Wednesday Addams,” on view – a lacy gothic choker in dark silver, smokey topaz, and Polish flint. Then, on the other side of Lake Washington, I have a piece on display at the Bellevue Arts Museum Store. It is part of the Seattle Metals Guild featured exhibit near the elevators, showcasing “Pins” (know of any other famous pins that are on display right now?). Check out the amazing exhibit upstairs, then you might feel inspired to start a pin collection of your own. The pins are only on display through June 7th, so don’t miss it. 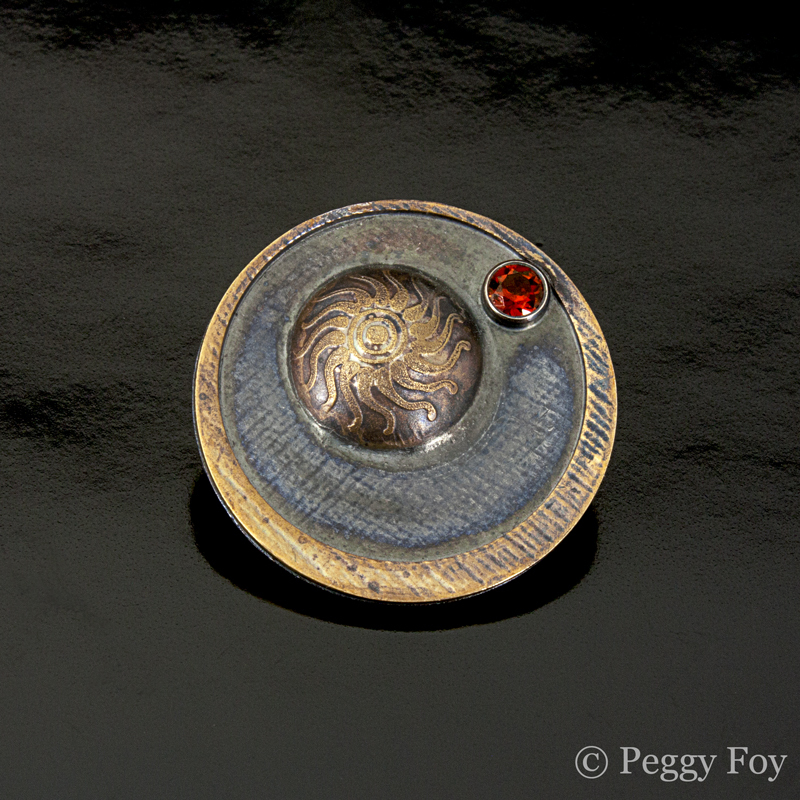 Orbit: Sun and Mars; sterling, brass, garnet, nickel pinstem; 1″ diameter; 2013. Edited to add: I just learned that my piece isn’t on display anymore because it went home with someone! 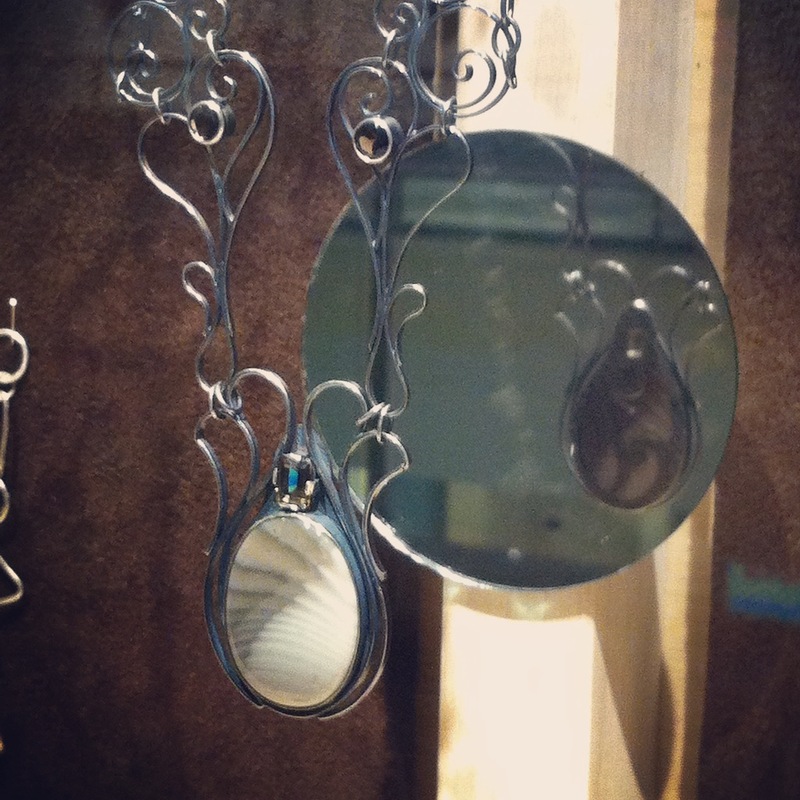 There are still many lovely pieces by other SMG members on display… Collectors, get ’em while you still can! If that’s not enough awesome art jewelry, stay tuned for First Thursday Artwalk in June — where I’ll have some fabulous guest artists doing a trunk sale in my studio. Save the date for this one, more news to come — it’s going to be a good one.